In order to keep SharePoint libraries easy to overview, it is necessary to remove files that are no longer in use. Sometimes you don’t want to delete files but want to keep them for future reference, for example in an archive library. By using libraries instead of subfolders, you make it easier to search the documents. 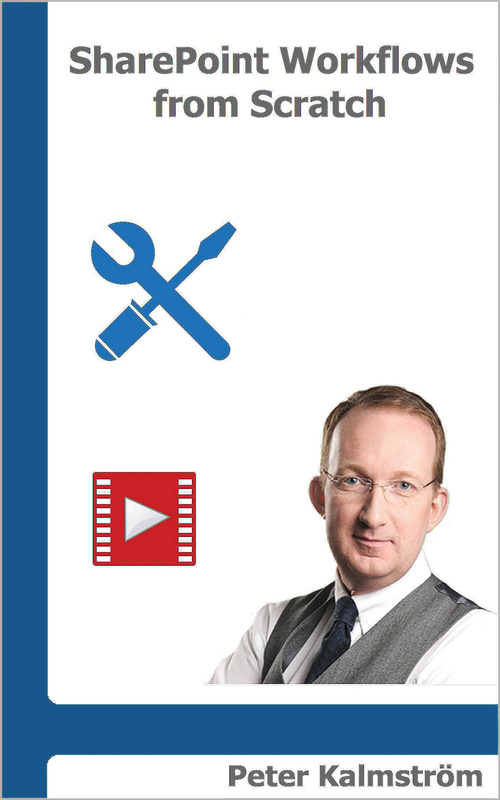 In this Tip Peter Kalmstrom, a Microsoft certified SharePoint specialist and trainer, shows a workflow that moves SharePoint library files into an archive library automatically, when the document status is set to Expired. Peter uses SharePoint 2013 in the demo below, but the workflow for library files archiving works for SharePoint 2010 too. On the SharePoint site, create an Archive library and a Status column. Select add an app and create a new Document Library . Open the original library. From the Library tab, go to Create Column to add a new column for status. Select the Type “Choice (menu to choose from)” and enter choice values (in this case New, Ongoing and Expired). From Lists and Libraries, open the original library. From the List Settings tab, click List Workflow and create a workflow. Open a summary page for the new workflow. Under Start Options, check all checkboxes. 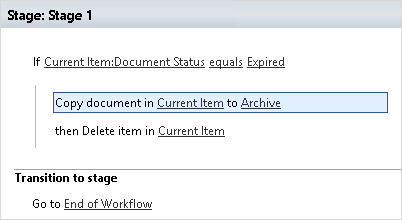 Go to Edit workflow under Customization and set the Transition to Stage as “End of Workflow”. Press Condition and select If value equals value. Now you will get the text "If value equals value" under Stage 1. Click on the first value and set the return field to the newly created column name. Here it is Document Status. At the place of the second value you will get a dropdown with the Choices values that you set while creating the column. Select the value that you want to use as a trigger for the move to another library, here Expired. Press the Action button and select Copy Document. Now you will find the text “Copy Document in this library to this library” at Stage 1. Set the second this library to the Archive library you have created. Press the Action button and select Delete Item. Now you will find the text “then Delete item in this list” under Stage 1. Click this list and select Current Item. Now whenever you set the Document Status column of any file in the original SharePoint library to Expired, that file will automatically be copied to the Archive library, and the file from the original library will be deleted.